My Garden Has Been “Featured”! This was the photo featured in my friend’s blog! 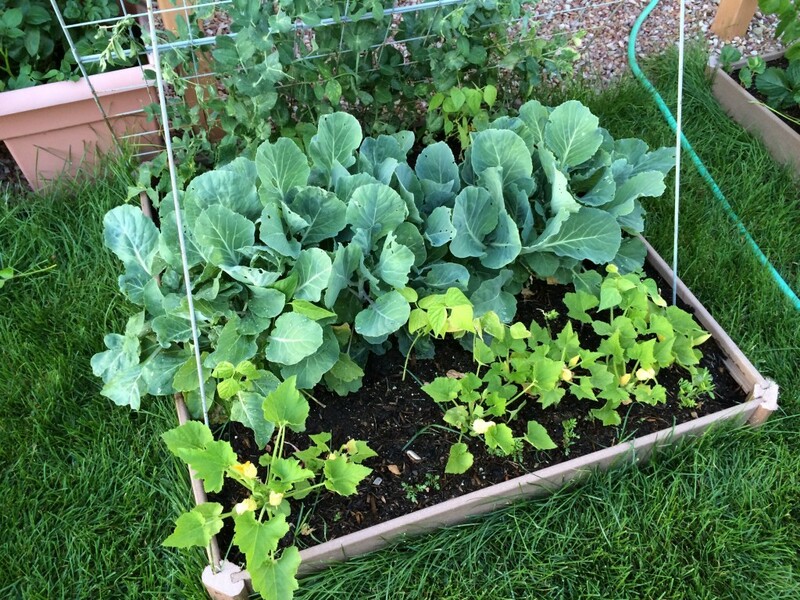 My friend, former GeekMom writer, and fellow gardening fan, Kris Bordessa has a really informative blog called Attainable Sustainable. She blogs about tips for a simpler lifestyle, whether it’s via recycling, living off the land, or reducing your personal energy consumption. I encourage you to follow her online community on Facebook, it’s a hopping place to go to discuss gardening and recycling topics. She set up a Facebook page where we can share photos and stories of our gardening, and today she picked some of the photos to feature in a blog post about different gardens around the country (and perhaps the world!). I’m honored to have our garden be part of the post! 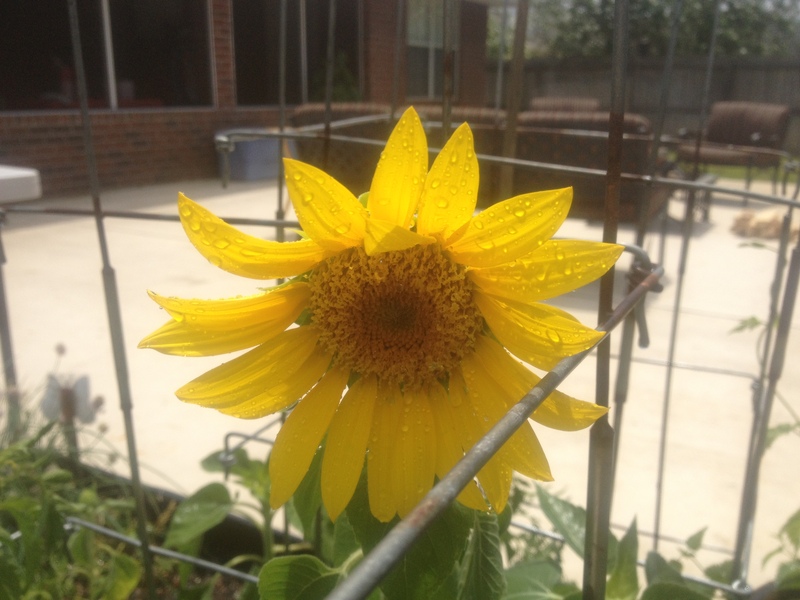 I’m Finally in the Mood to Do a Little Writing….So I’ll Talk About My Garden! My backyard garden. 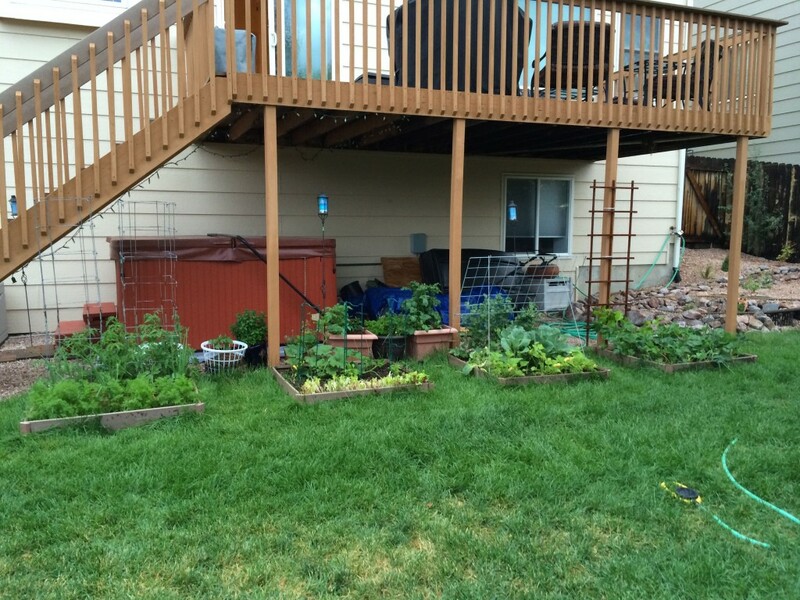 It isn’t big, but it’s been a great time seeing what can (and what cannot) grow in Colorado. See the sprinkler in the lower right? That’s on a timer to run for 15 minutes every night. In this climate, you will never have too much water for your garden. A far departure from Florida. This may sound strange, but now that we’re done with all of our June/early July travel, our lives will be calming down. We will still be busy, but things will be less chaotic. I have so much to write about, I’m thinking, where to begin??? The boys’ never-ending baseball season? Our trip to Pennsylvania and West Virginia (with a little side trip to Penn State in there)? My returning to work full time? How about our travels to Durango, the Grand Canyon, and Moab? I’m going to start with my garden, because that’s been quite the adventure in itself. I know it was silly, but I did start a garden here this spring. In part because we did a Cub Scout den project that involved planting seedlings. I ended up with several leftovers and I just stuck them in my garden plot. Enjoy some pictures of the modest little harvest I might have had if it weren’t for all the bugs and birds that helped themselves first. I planted the garden in late March. By May it was looking fantastic! Too bad the birds thought so too. Crookneck squash. 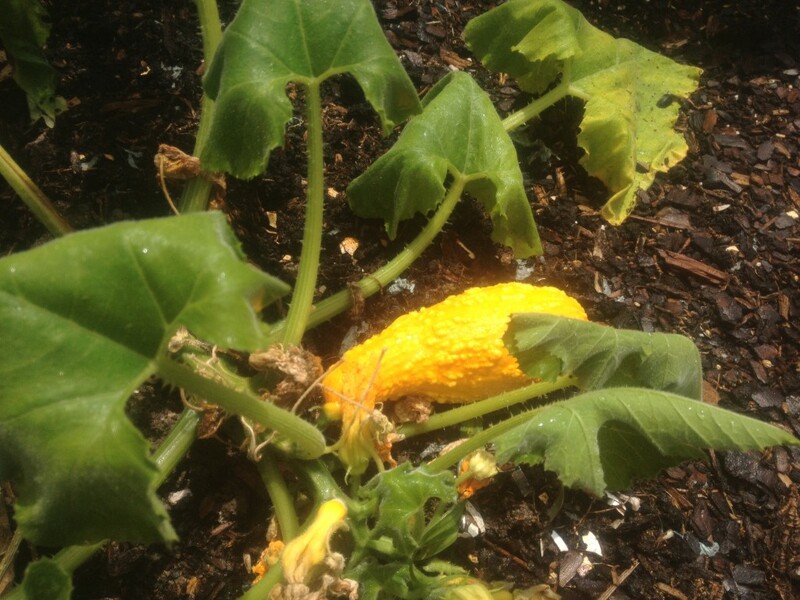 Timmy was very interested in how squash grew…too bad he doesn’t like squash. I have quite a few tomatoes, and I’m sad about having to walk away from them all in a couple weeks. I’ve decided it’s time for me to get my list in writing. I turn 40 later this year and I figure that’s half of my life complete (based on U.S. census tables), so it’s time to set some goals for the latter half of my life. I see and hear about things all the time that prompt me to say to myself, “I should do that before I die!” And then I tend to forget about it. These are the big-ticket things I’d like to do one day. Most of it is traveling, but I’ve alway felt that there’s so much of the world to see and learn about. No, I don’t have the money or time to do a lot of these things. But that’s what I have the rest of my life for, right? And it appears that much of it is visiting stuff. 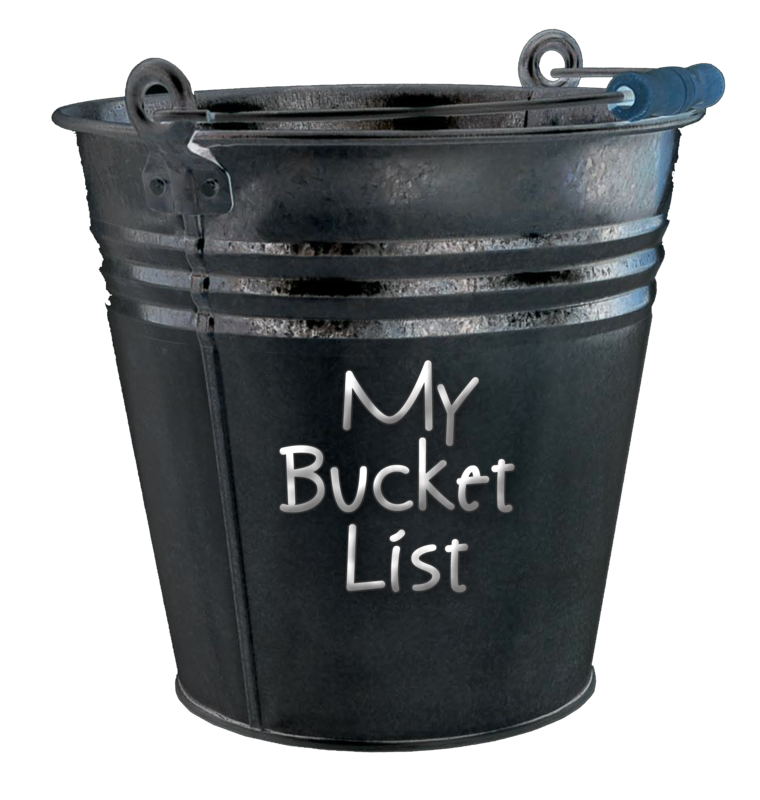 Leave a comment if you think there’s something else I should try, or if you have tips about something on the list, or if you want to share your own bucket list items! 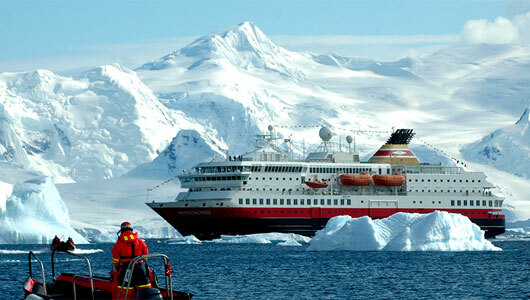 Yes, I would like to do this one day: Cruise to Antarctica. Learn to snowboard (Note: I tried to learn, twice. I’m too old for this crap). See the Passion Play in Obergammerau, Germany in 2020. Take the kids. See Macy’s Thanksgiving Day Parade live. Yeah…um…I had a good old time today photographing assorted stuff with the new camera while I was doing lawn work. 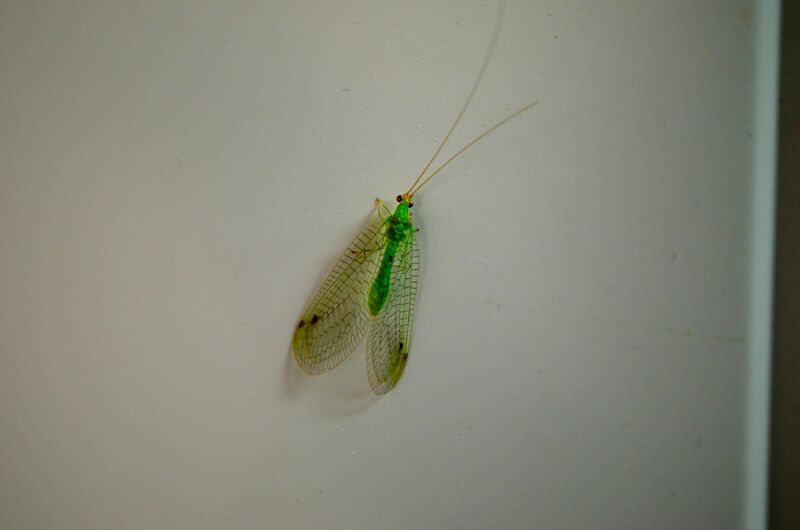 First of all, this lacewing has been sitting all day on our door from the garage into the house. I’m starting to dabble a little with the post-processing that iPhoto offers. Dave has numerous other options in his Paintshop Elements but I haven’t used that at all. The lacewing pictured here is simply my hitting the “Enhance” button. The next picture is of some “slime mold” that’s been in spots all over my front lawn, due to the volumes of rain we’ve been getting. Sunday was a really nice day, the family got to visit the beach. It was the first day in over a week that thunderstorms didn’t chase us indoors. As a consequence, though, my lawn is covered in mushrooms, dead spots due to grass root rot and this spotted moldiness. Click in the link in the caption below to learn more about this stuff. There’s nothing I can do about it but let it run its course. I fiddled with the more fine tuning features in iPhoto to make this picture greener than the original picture. Learn more about grass slime mold through this Ohio State Extension service flyer. Florida Discoveries 19: You Can’t Grow Hops in Florida!! 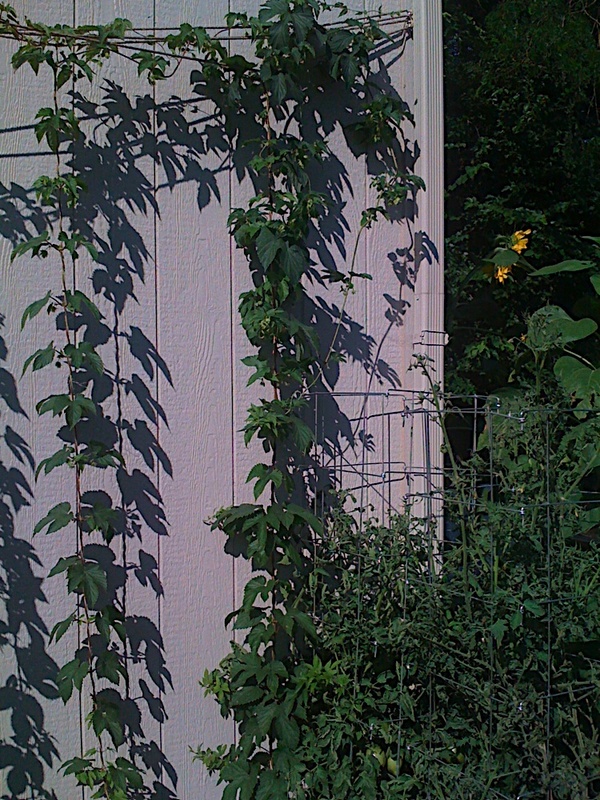 Many of my more loyal readers know that in Nebraska Dave and I were able to grow hops in our backyard. We had a cool landlord/homeowner who gave Dave permission to dig up part of our backyard and string up trellises to grow hops (among other fruits and veggies). In summer 2009 and 2010, we had this EPIC WIN of hops harvests! The vines climbed up so high, and it was a lot of fun to learn about how hops grow. We left Nebraska last fall with about 3 ounces of vacuum-sealed dried hops ready for the next time Dave decides to brew…probably once the weather cools down. 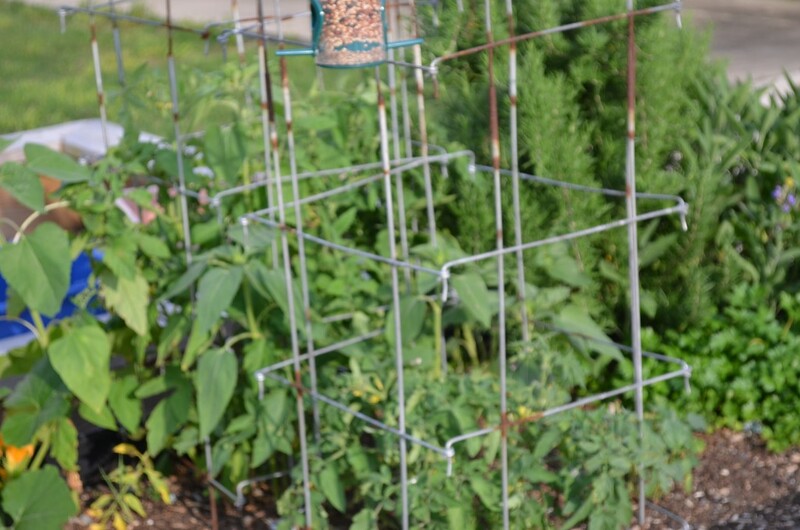 The top ropes on this trellis are 8 feet tall! These were awesome! These flowers were ready to harvest in late July 2009. But here in Florida, the goal is survival! I gave away several of our hops rhizomes and tossed a few in a lightweight pot when we moved from Nebraska to Florida. This spring the rhizomes sprouted but without the appropriate humidity and sunlight (the sunlight requirements for ideal growing conditions are at 35-55 degrees latitude), we didn’t get much at all. This morning I took some pictures of the plant at the most growth it had this year. Here in Florida, all I can hope is that we keep these alive until we get back that far north again. So far, so good. You can’t make this stuff up! About 2 feet long, compared to the 10-12′ vines from Nebraska just one year prior! All I can do is hope that the plant remains alive while we’re living here…. This is about 1/2 of the backyard in view here. You can also see our backyard on our weather webcam here. For some reason the homeowner removed every…single…tree…and…shrub from his lawn. On Google maps you could see an area of pine trees in the middle of the backyard, but no longer. More for me to mow. I’d been wanting to do this for months, and it wasn’t till just before Labor Day that I finally did it! I measured the distance covered mowing our big backyard. I also measured the time and the calories expended doing it. Remember, I’m a numbers girl! It wasn’t hard — I guess anyone could do it with a pedometer, right? But of course I had to get all techie! We have an enormous lawn, and because we won’t be living here that long, we chose not to invest in a riding mower, and just tough out using our 11-year-old 21″ wide push-mower. When we first moved here in the cooler season, this wasn’t so bad. I didn’t have to mow at all for the first 3 months, and then it wasn’t often. Note: Many of you know that I’m the one who mows the lawn in the family. I don’t mind at all. Until we moved into this particular house, doing this chore wasn’t a big deal. In fact, if I mow on weekends, it’s a nice break from the kids! Dave has horrible grass allergies, and I’d rather take on this chore than deal with his nose-blowing after he does it. But by Memorial Day, in order to mulch the grass I was cutting (I can’t stand bagging/dumping grass), I had to mow no more than weekly, preferably every 5 days to minimize clumps of dead grass among the mulching. It got really old really fast. I need about 2 hours to do the entire lawn, but not while the sprinklers are running, or first thing in the morning when the lawn is covered with dew. So I’d usually wait until as late in the evening as possible, and mow mow mow until I couldn’t walk in a straight line anymore because it was so hot. And I’d still be soaked in sweat. Between the sweating, sore arms and all the walking I was doing, I figured I’d regard this as a real workout. Ignore the fact this is being called a “run”. Obviously it isn’t, as seen by the 22:23/mile pace. This is the front yard only. It’s about 1/2 the size of the back. 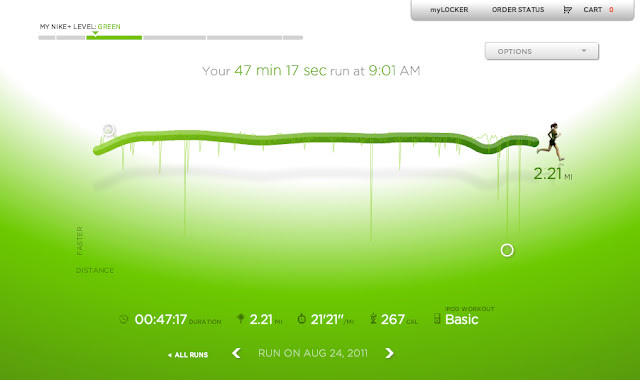 The thin line is a micro-measurement of my pace, and it makes me wonder if there’s a slope to our yard. I was mowing in rows parallel to the front of the house. 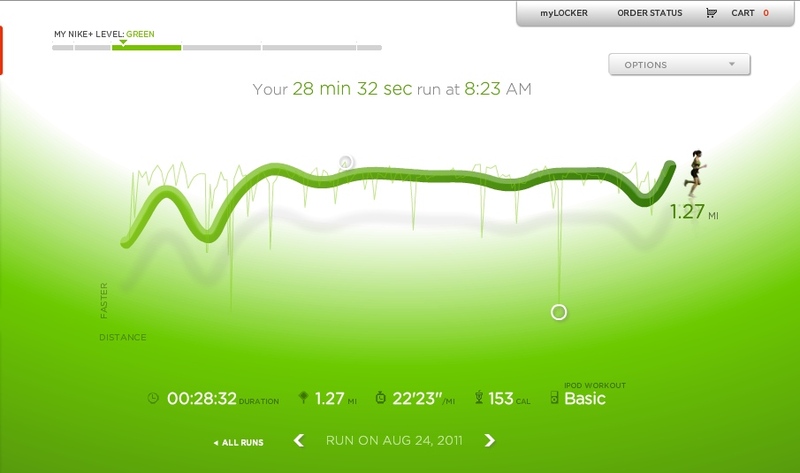 The deep plunges in the pace graphs are water breaks. The backyard. Almost double the distance and a slightly faster pace, which I can attribute to much much longer rows. So I now know that cutting my yard takes about 1:15 hours (with no breaks, but I take 15-20 minutes worth of breaks), is 3.48 miles, and expends 420 calories (which for me is the same as a 3.5 mile run). Earlier this year (in the middle of their summer lawn-mowing season I assume), two Australian mathematicians calculated the ideal pattern to mow your lawn with minimal mileage. This past spring, Wired.com posted this How-to Wiki with ideas on how to make the dreaded lawn-mowing chore more tolerable. From getting rid of grass in favor of flowers, trees and shrubs…to robotic lawn mowers (i.e. Roombas for your yard!). 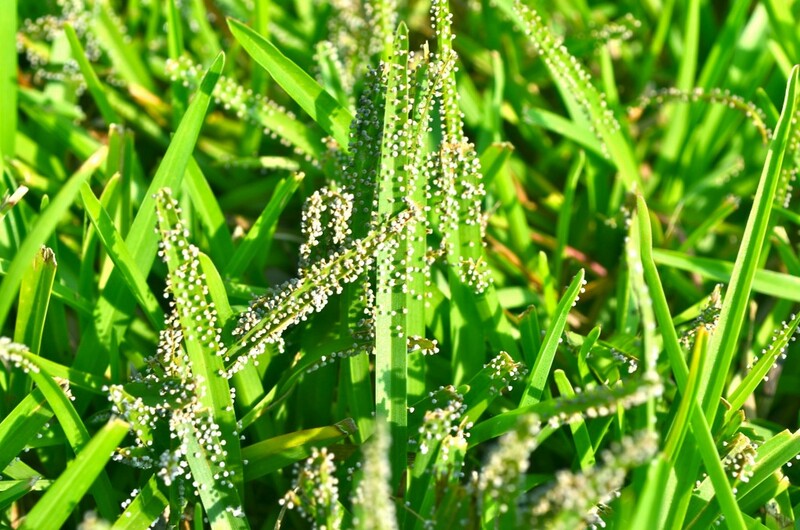 You usually see these things curled up about 1/2″ down in your lawn. Not crawling across your street in 90F temperatures! Kudos to my iPhone camera for getting some nice (or not so nice?) closeups! Over the course of the day, the stamen will produce their bright yellow pollen, such as what’s seen here. It’s all very fast…this flower was wilted by sunset. As promised two posts ago, here’s a nice pretty post for you. 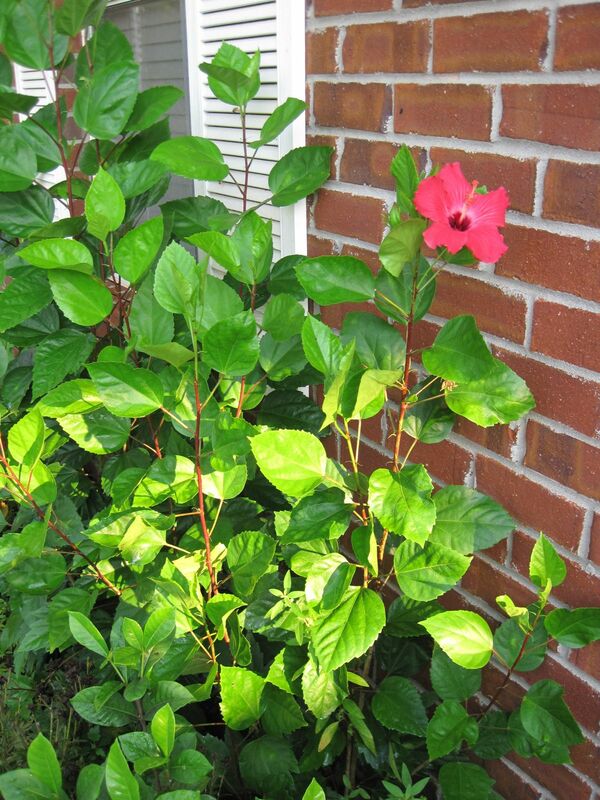 This is our Chinese hibiscus (Hibiscus rosa-sinensis) plant that grows in front of Jacob’s bedroom window in the front of our house. I was pleased to see these flowers this summer, since the week we moved into the house in late November 2010, we had a hard freeze that essentially killed off the 5′ tall plant for the season. But in April it came back! Unfortunately, when the hibiscus plant has to start from scratch, it’s tough to get the profuse flowers that I was accustomed to in Hawaii (where my Dad was stationed then when I was ages 3-6) and Melbourne, FL (when we were stationed at Patrick AFB). These flower bring back so many memories of living in Hawaii where our house (we lived in military housing) had a tall hedge-like row of hibiscus along one of the outside walls. I’ve been seeing the occasional flower this summer…hibiscus flowers only last one day so it’s been tricky getting outside at the right time to photograph it. It needed to be before lunchtime, and most of this summer I simply wasn’t thinking about heading out to photograph the front yard until it was too late in the day. Once school started, and the kids were playing in the front yard while waiting for their respective buses, I had a chance on the first day of school to get these shots of a fresh bloom! The flowers are about 5-6″ across. Florida Discoveries 16: Follow That Bird! Help Me Identify a Bird…. That beautiful garden from last March-May? All but dead. The insane heat, plus the lack of rain earlier this summer made it tough to maintain after our vacation. 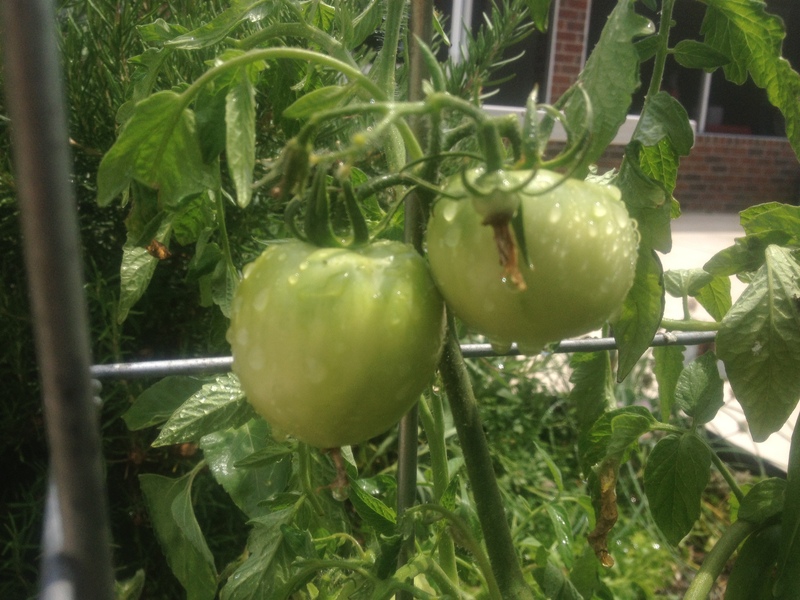 Between the tomato hornworms, blossom end rot and other crap, I just said “forget it”. It was too hot to even stand outside to prune. No fun! My herbs are surviving, which can be expected since they typically survive on less water than fruit-producing plants. I let my basil go to seed — I tried to keep the seed stems picked off, but couldn’t keep up — and lately it’s been a popular hangout for my backyard birds. More popular than the two bird feeder areas I have on a different part of the yard. This has been fun because the garden containers are right outside our back door and the kids can watch the birds while they’re eating breakfast in the morning. We’ve been seeing finches, sparrows and cardinals hanging out at my basil, and even the occasional bluebird who is after the bugs that hover around my herb flowers. This photo was taken through my screen porch, there’s a house finch among the basil. Latecomers hang out on my cucumber trellis to wait for their turn. Much less traffic at the bird feeders. This morning I had my usual assortment, but then this HUGE bird was trying to get in on the action. (“Huge” is relative — I have a blue jay that hangs out in the front yard, but this is the biggest bird I’d seen in the back). I haven’t researched what kind of bird he is, but I’ll post the pictures here and see if you can help me out. My hypothesis: a northern mockingbird fledgling.